Babblings of a Mommy: Pureology: A MUST For Color-Treated Hair! Pureology: A MUST For Color-Treated Hair! I'd thought I'd share with you a new hair system I started using and have fallen head over heels for! 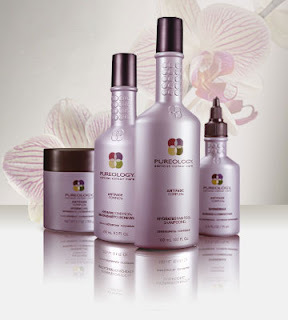 Pureology is an all natural comprehensive color care system for all hair types. It's completely vegan and has zero sulfate plus it has an exclusive anti-fade complex to protect our hair color. They have a ton of systems to choose from but I've been using the Hydrate System, and after only few washes I can honestly tell you this stuff is ah-ma-zing!! Hydrate is designed for colour-treated hair in need of deep hydration, nourishment, and colour protection. Enhanced with advanced hydrating technology and pure natural ingredients, this system restores dehydrated hair while the ZeroSulfate shampoo and our AntiFadeComplex® maximizes colour retention. When they say hydrate--they're not joking. This system leaves my hair super moisturized and amazingly shiny. If that weren't enough to make you fall in love, it also makes your hair color last 10x's longer! (For someone who has to touch up her roots every few weeks and cover those few stubborn grays (shh..don't tell) this product is practically a God-send.) Overall, it has done wonders for my thick wavy hair! I can't say enough good things about it. The smell. Because it's made out of peppermint and green tea, it has a very distinctive peppermint smell. Not my favorite, but for the trade-off not a deal breaker either. The price. I'm not gonna to lie to you, Pureology is expensive. Especially when you start getting into the bigger bottles--you can spend anywhere from $26 to $50 each depending on what size you get. But trust me it's worth every penny. Availability. Because this is a salon product you most likely won't find it at your local store. You either have to find a salon who carries it or order it online. Did you notice a change in your hair? *I was not compensated for this post nor was I given these products for free to review. I've never used it but everyone says such good things about it! I should definitely try it. You should! It's definitely worth a try! I love this stuff - it smells so yummy.